Got a Bee Problem? Get a Quote Now! Looking for a solution to your bee problem? Stung and Sticky Beekeeper, LLC is here to help! 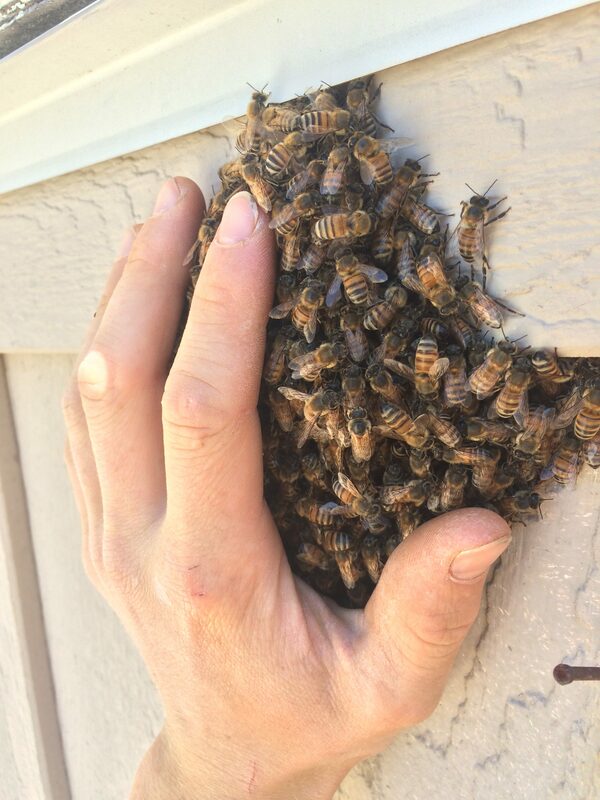 We have removed hundreds of beehives across the Phoenix/Scottsdale Arizona Valley. We do not exterminate the bees or use harsh chemicals to remove the them but keep them alive and relocated away from unwanted locations. We are here to take care of any bee situation you find yourself in while remaining affordable. We have dealt with almost any bee infestation from homes to caves up in mountains. No job is to hard for us! Let us take all the bee stings and get sticky as we expertly take care of you and your bee problem! For a free quote and consultation call (623)882-5890 or visit our contact page! 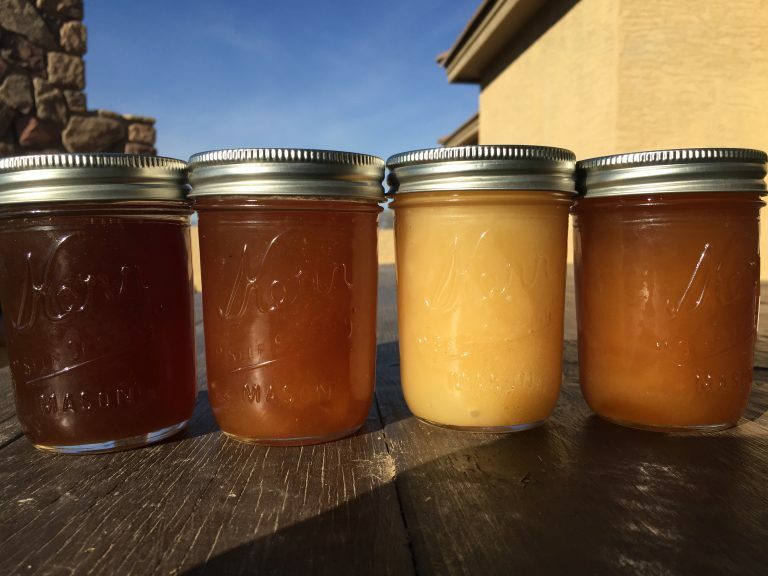 We now have raw, unpasteurized, honey for sale! We never feed our bees with syrups/sugars but let them feed of the local floral. Also, we never medicated them or feed them artificial pollen. Pasteurized or highly processed honey is basically dead honey if even honey…that is why we never pasteurize or highly process any of our honey. Our honey is full of flavor and is in it’s most natural form…as it was meant to be. No sugars, syrups, or medications...ever! "Everybody needs to call this beekeeping service for removal of bees and any other services relevant to bees. Very professional, polite, informative. I did some research on pricing with other beekeepers and they are well within range and well worth every dime. They get out to you as soon as possible and follow up with repair recommendation for your home if needed." We do our best to keep our prices affordable, up-front, and competitive. We, as a business, don’t offer free bee removal do to the fact that removing a beehive can be very labor intensive and requires hours of labor. For a free, no obligation quote, give us a call at (623)882-5890 or visit our contact page! In most cases we get someone out to you the SAME DAY and our phones are available 24/7. We don’t use harmful chemicals or pesticides to kill the bees. 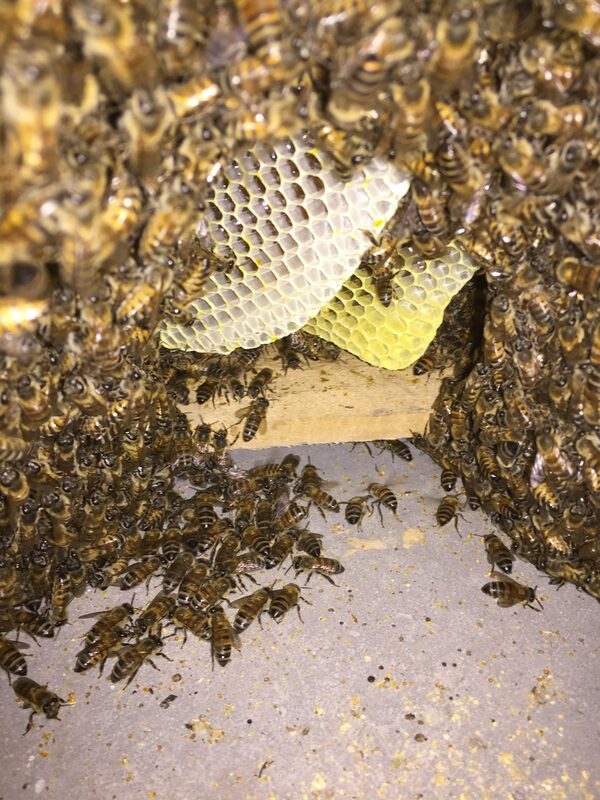 We are beekeepers that know how to successfully take care of your bee problem WITHOUT the use of poisons WHILE keeping them alive and relocating them to a apiary for them to make a new home away from the unwanted location. Bees are very much needed and there’s really no benefit gained by having exterminated. We never kill any bee hive or swarm. To talk to an expert beekeeper call (623)882-5890. First off, we are in need of bees. Honey bees and all types of bees are very important to the Eco-system of the world, providing cross pollination between plants. Second, using chemicals to kill off a hive doesn’t really take care of the issue. It leaves all of the honey/comb that the bees have built there in their stay right where the hive was – sometimes even 100+lbs of honey and brood (the baby bees) can be left inside. With the bees dead this causes the beeswax to melt, the brood to rot, and the honey to soften, which, if in a house, it will run down the walls making a mess. All this honey mess acts as a HIGH attractant to other bees that may be looking for a home in the future. Bees like to live where another hive(s) have lived – we’ve seen it time and time again where bees moved right next to where an old hive was exterminated. It ALSO attracts other pests such as roaches, rats/mice, ants, etc. 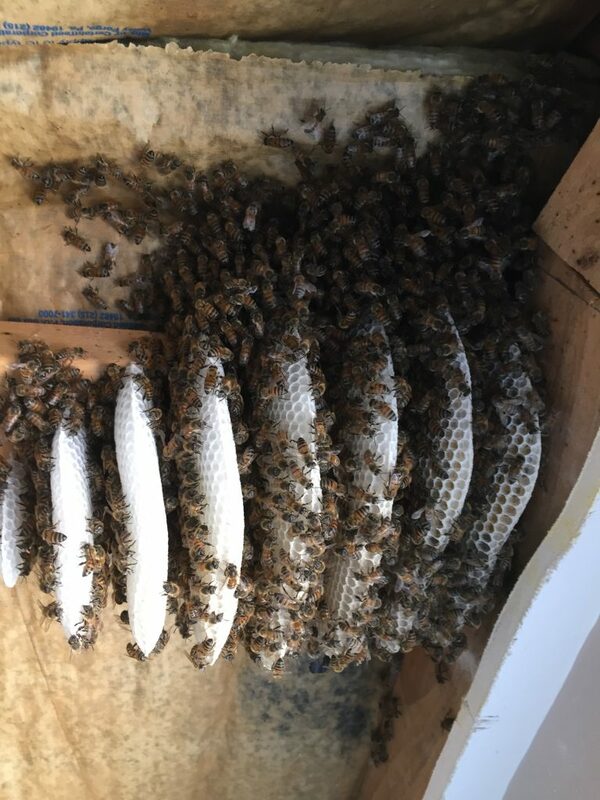 We never leave the honeycomb/brood but always take it all out to prevent future re-infestation and other problems while at the same time keeping the bees alive. Don’t call an exterminator who won’t fully take care of the situation. We are beekeepers that know bees and know how to safely remove them from your property. Call (623)882-5890 or visit our contact page to get a free analysis and schedule a appointment with a professional beekeeper. 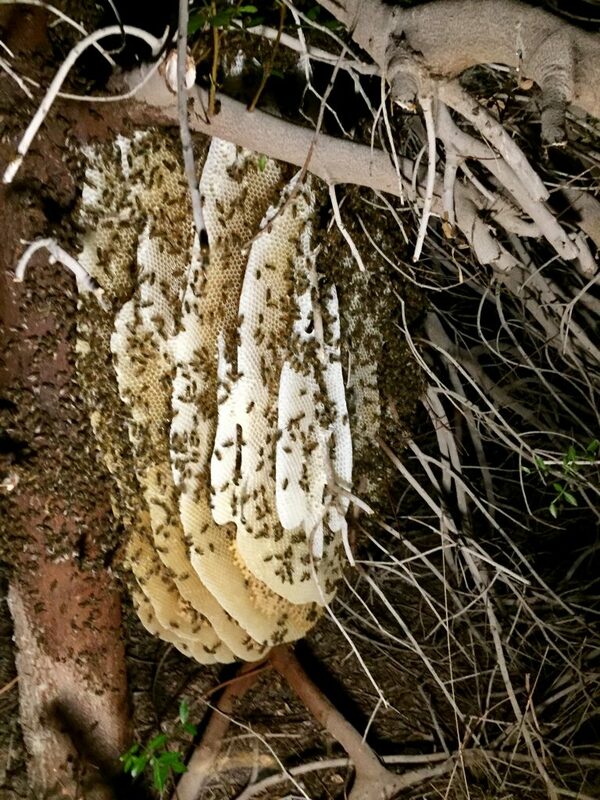 Please Exercise Great Caution Around Any Bee Hive You Find Near Your Premises. The Africanized Bees, In Particular, Can Be Extremely Aggressive And Need To Be Removed By A Professional. Don’t Try To Spray Them Or Seal Them In. For You Safety Leave The Bees Alone! Call (623)882-5890 now or visit our contact page to get a free consultation and schedule an appointment. 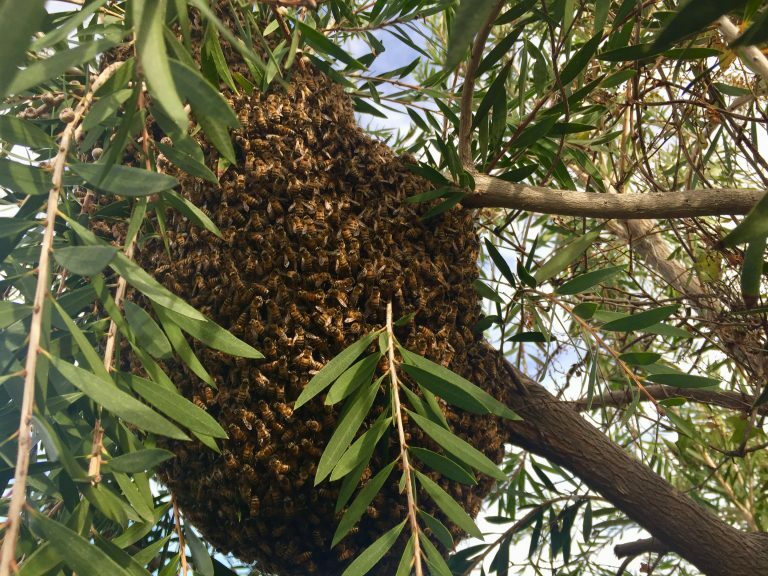 We specialize in any type of live beehive and swarm removal from residential or commercial properties across the entire Phoenix/Scottsdale Valley and surrounding areas. We are professionals in what we do – no bee relocation is to hard for us.